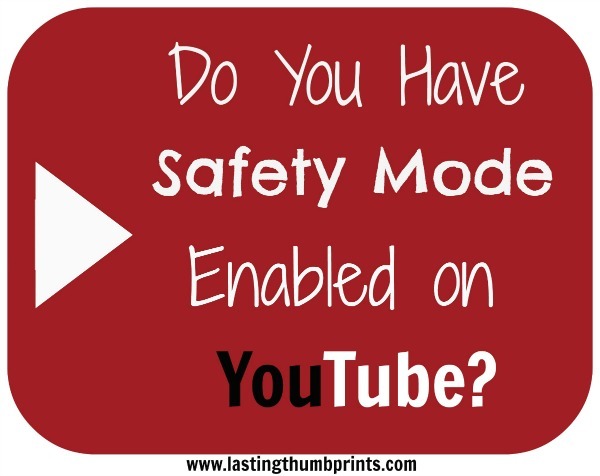 Did You Know YouTube Has a Safety Mode? The old saying is right, you learn something new every day. I was thrilled to recently discover that YouTube has a safety mode. Now maybe I’m just coming out of the technological ice age and everyone else on the planet already knows this. I openly admit I am being forced kicking and screaming into technological enlightenment due to the ever increasing use of it by our children. The internet is an amazing educational tool that we use in our house frequently. We use and love Easy Peasy All-in-One Homeschool as a supplement to the other homeschool curriculum we use. Part of the Easy Peasy curriculum for our youngest students includes quite a few YouTube videos. I get nervous about how easy it is for them to click on other videos when their assigned video is done. The resident teenager of the house is currently into playing airsoft with his friends. He enjoys watching airsoft videos on YouTube to learn about his guns and other equipment. Again, a nervous mama this can make. Nothing can take the place of adult supervision. Period. But there are certain tools that can make it a bit easier. Especially if you’re like me and become easily distracted. The safety mode on YouTube is one of those tools. YouTube safety mode helps filter out inappropriate content. It is reliant on user flagging, age restrictions, and other signals to screen out objectionable content, which means it is not 100 percent accurate. Here’s an article that will help walk you through enabling the safety mode on your account. It’s very simple to do. It must be done for each separate YouTube account. I chose to lock the safety mode option on our accounts so it would stay on permanently. A note, if you do not log out of the account, the settings can be changed by others. If you use different browsers, you will also have to go in and enable safety mode in each browser. It seriously only takes about 1 minute. Not a big deal. Update: If you are looking for information on how to set up YouTube safety mode on your mobile or YouTube app click here. I would also recommend checking the video viewing history to see what your kids have been watching if you are not always in the same room. This just adds another layer of accountability. This can be found by clicking on “Watch History” in the left toolbar under the YouTube account name. Do you have any tips for keeping kids safe on YouTube? I’d love to hear them! I didn’t know about the safety mode on You Tube but I did know that you can set up SafeSearch for Google. It sounds like it works the same. You log into your Google account, set up SafeSearch, lock it, and then log out. This also locks Google Images as well! Thanks for sharing- I’m going to set that up! I learned about Google SafeSearch at the same time I learned about YouTube’s safety mode. When you turn on the YouTube Safety Mode it automatically enables Google SafeSearch. But if you disable Safety Mode for YouTube it will disable Google SafeSearch, so that may be something you want to keep in mind as you use them. I love that SafeSearch locks the images also! LOVE this! Didn’t know it existed but just did it. But, how can you set it up in mobile???? Help! 2. Press the Menu icon in the upper-right hand corner. 4. Press Safe Search. You should now see it listed as On. Would you please let me know if this works? If it does, I will update the post with that information for others! I did it on mobile the way you suggested and it worked. I couldnt lock it from there, however. I had to sign into my google account, go to settings on the bottom right, and lock safety mode from there. That’s great, Sandi! Thanks for letting me know! You can use an app called quiet tube to let kids view only the selected you tube video. It blocks all the pop ups and suggested videos. Of course like stated earlier the parent/teacher needs to find and preview the video then reopen the selected one in quiet tube for the child students to view. I use quiet tube in the classroom with all YouTube videos I show.